New ballistic missile submarine fleets could destabilize the nuclear order. Editor’s Note: These are the prepared remarks of a speech the Naval Diplomat delivered at Lowy Institute International Workshop on SSBNs and Strategic Stability, Mandarin Oriental Hotel, Singapore, May 14, 2014. It depends. Consider the Cold War legacy first. From a strict Clausewitzian standpoint, the answer would probably be more safe on balance. Safe means stable, predictable, and nonviolent in this context. With all its mind-boggling devastation, a nuclear exchange would approach what Clausewitz termed “absolute war.” By that, Prussia’s master of strategy means a single act or a series of near-simultaneous acts utterly divorced from rational political calculations — bloodletting for its own sake, bereft of larger purpose. Clausewitz doubts armed strife will ever escalate that far, degenerating into a spasm of absolute violence. Policy will intervene in all likelihood, applying the brakes to escalation. Decision-makers are rational beings for Clausewitz, or should be. Few belligerents, that is, attach such value to their political objectives that they’re prepared to undertake an effort of extreme “magnitude” or “duration.” That’s doubly true when an unlimited counterstroke against their homeland is a real prospect. Limited aims warrant efforts that are shorter, consume fewer lives, armaments, and treasure, or both. Modest pricetag, modest expenditure. By Clausewitzian cost/benefit logic, then, SSBNs disgorging fusillades of nuclear-tipped missiles cannot qualify as a rational act of statecraft. No sane statesman on either side would give such an order. It defies Clausewitz’s brand of Enlightenment rationality. Ergo, deploying invulnerable launch platforms carrying massive payloads must make the strategic environment safer. And yet the Prussian theorist also teaches that there are three ways to prevail in armed conflict: by shattering an opponent’s forces on the battlefield and imposing one’s terms, by convincing the opponent victory is improbable, or by driving up the costs to him so high that the effort makes no sense in cost/benefit terms. The first method applies only in wartime, when an actual trial of arms determines the outcome. The other two methods apply during peacetime strategic competition as well, when, as Thomas Schelling notes, coercion and deterrence result from the skillful non-use of military force. Trying to dishearten an adversary or convince him an endeavor isn’t worth its price is a matter of communication — not just of persuasive words but of arranging implements of national strength so as to back up those words. And, needless to say, communication between antagonists from different countries — or civilizations — can be a dicey prospect. Think about it. While the rational calculus appears objective, the value assigned to each variable — in particular appraisals of the worth of one’s political aims — are intrinsically subjective. Dark passions — fear, spite, envy — thus shape calculations about goals, risks, and perils to a disquieting degree. Decisions may appear foolhardy to dispassionate observers yet make perfect sense to competitors amid the hothouse environment of nuclear strategy. Differing political and strategic cultures, moreover, can give rise to differing attitudes toward the uses of nuclear weapons and delivery platforms — including SSBNs and their armaments. We need not yield to cultural determinism to posit that unlike worldviews beget unlike strategic assumptions. The late Cold War witnessed a lively debate over whether Soviet leaders accepted the logic of mutual assured destruction or believed they could win a nuclear exchange. Nuclear oldtimers stage similar debates whenever a newcomer joins the nuclear-weapons club. Whether fleet boats made the Cold War safer also depends on whether a stable equilibrium prevailed between the Eastern and Western blocs. Steady-state competition imparts predictability to the one-upsmanship typifying competitive interactions. If undersea fleets are largely symmetrical, each navy reposes confidence in its opponent’s competence, and neither scores some breakthrough that negates the other’s undersea deterrent, then the prospects for durable deterrence brighten. Transients and asymmetries, on the other hand, may upend stability at least temporarily. 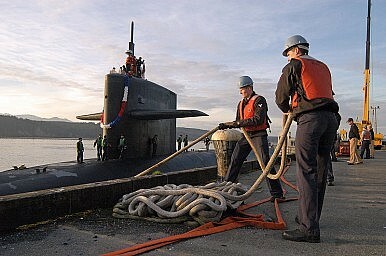 The United States was first to deploy an SSBN fleet. Its monopoly on invulnerable second-strike capability gave Washington an asymmetric if perishable strategic advantage in the Cold War. If one competitor boasts an invulnerable deterrent and the other feels insecure, strategic calculations could swerve in dangerous directions in both capitals. Or the existence of fleet boats may set a cycle of challenge-and-reply in motion, with each contestant developing countermeasures against the other’s undersea deterrent. Advances in American anti-submarine warfare, for example, made a U.S. Navy offensive into Soviet SSBN “bastions” — offshore patrol grounds guarded by land-based tactical aircraft and surface combatants — thinkable by the 1980s. How Moscow would have responded to an offensive-minded maritime strategy aimed at SSBNs must remain speculative, but a use-it-or-lose it mentality may well have taken hold among the Soviet leadership had the Cold War persisted. On the whole, then, SSBNs probably made the Cold War safer during intervals of strategic equilibrium, damping passions even when trouble loomed. But they may have made the East-West competition more hazardous when one side appeared to gain the upper hand, either technologically or through tactical or operational innovation. One downside of a more multipolar world is a more intricate geometry of deterrence. Rather than bipolar competition, there are many competitors. They have attained differing levels of nuclear development. And they may be on different atomic trajectories. Some are on the ascent, building their arsenals, while many established nuclear-weapon states are pursuing arms control and reductions. This setting will complicate the making of strategy while potentially fanning misperceptions. Rather than deter a single hostile state or alliance, each SSBN-deploying power may have to deter more than one. Foreign capitals may wonder at whom a competitor’s SSBN patrols are aimed — and modify their nuclear strategies accordingly. Kaleidoscopic geometry may give rise to perpetual strategic and operational flux. Technological development will proceed at various speeds among new nuclear states — molding strategic and operational decisions in ways that could prompt dangerous moves on others’ behalf. For example, the Indian Navy’s fitful progress at constructing submarine-launched ballistic missiles — range limitations in particular — promises to compel New Delhi to send SSBNs into the China seas to establish sea-based deterrence vis-à-vis Beijing. The presence of Indian missile boats in these waters — waters China considers a nautical preserve — could prove highly troublesome. How Beijing would respond remains unclear. Relative U.S. decline combined with the rise of new great powers may fray arms-control and nonproliferation accords. The logic of self-help endures in international relations. Should American extended deterrence lose credibility, the pressure on allies such as Japan and South Korea to go nuclear would mount. Should Tokyo and Seoul forgo proliferation, Beijing will command a significant coercive advantage as the PLA Navy’s first serious SSBN fleet enters service. Whether smaller Asian powers would bandwagon with China, combine to balance against it, or make other arrangements remains to be determined. New nuclear-weapon states will possess modest-sized, and probably vulnerable, inventories for some time after they breach the nuclear threshold. Manifest insecurity could prevail in such capitals — especially when they face off against established nuclear powers that deploy invulnerable SSBN fleets. Newcomers to nuclear-weapons status would inhabit a danger zone, with oldtimers tempted to strike against emerging arsenals. It is at least conceivable that some nuclear newcomers will see value in nuclear weapons both for deterrence and for combat use. Ascertaining the degree to which this is true, and determining how best to deter countries prone to brinksmanship, will influence SSBN deployment patterns as well as the use of other implements of deterrence. Foresight is a cardinal virtue for statesmen and commanders. The challenge before them, consequently, is to peer darkly into the coming world of constantly shifting nuclear strategy and forces. Consulting with rivals, allies, and third parties, keeping the Clausewitzian cost/benefit calculus in charge, and taming passions offers the best way to manage interactions in the second nuclear age. America's nuclear triad shouldn't be held sacrosanct just to please advocates in the U.S. Navy and Air Force. How Many Ballistic Missile Submarines Will Russia Build? The Consequences of a Pakistani Sea-Based Nuclear Second Strike CapabilityPutin's 'Red October': Russia's Deadliest New SubmarineRun Silent, Run 'Soviet? 'Japan: Joining the Nuclear Weapons Club? It Could.